Ok, so I am a listicle kind of gal. So do you love lists? Then what about a Bullet journal? All you need to begin is a pen and journal. You don’t need to buy a special journal although if you want one then you can find them on Amazon this is one of the most popular ones. I started my bullet journal for budgeting using an old notebook I had lying around and decided it was time to get organised for budgeting! So here are some Budget templates if you need inspiration for creating budget-related templates. If you are looking for things for your bullet journal then you have to see Stationeryangels she has some awesome stuff my favourites are the clips and charms – want to zing up your Bullet journal then they have what you need. The Instagram account also has lots of fab pictures for you to scroll through, in particular, this one caught my eye as an inspiration for budgeting. 2. Sheena of the Journal- love that title! If you are looking for tips on Calligraphy – how to create letters ( not the love kind) then her website gives you lots of hints and tips. It’s just beautiful. If only I could write like that!! 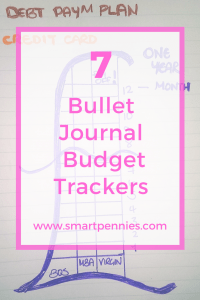 I just love Deborah’s website some of the tips are great if you are just starting out bullet journalling and want to get a handle on how to set up a budget template. One of her templates below is from her Instagram account but she goes through step by step how to set it up. 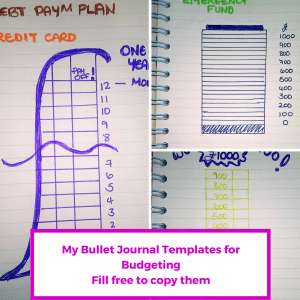 Has great tips on budgeting templates and also includes which templates you should have in your bullet journal. I just love love love her Pinterest account so colourful- if you are into stationary as well as bullet journalling need I say more!! Sigh the penmanship is wonderful. Did I tell you I use to practice Calligraphy – this was when I was a teenager it was very therapeutic- bullet journals weren’t a thing then! Have to admit this is one of my fav’s – the artistry is fab her Instagram feed has lots of different templates one of them did take her two hours! This one is great because it’s a six-month planner. Have to say another favourite – especially the piggy bank picture gives you real inspiration to save and create a great template! 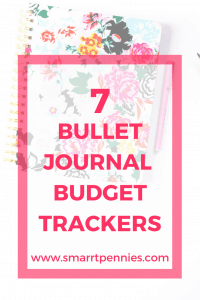 There you have it 7 templates to start your creative juices following when it comes to making a budget template in your bullet journal. I have started mine as you can see from my picture and hopefully it will keep me on track!